Thank you all so much for your kind words yesterday. They were like a balm to my hurting soul, I tell you. Words can hurt but words can also heal and many of you brought healing words to me. I am grateful and blessed. And, of course, Dale and I have made up. There was hugging and crying, followed by much kissing. Ahem. But let’s move on, shall we? Because I have knitting to talk about. 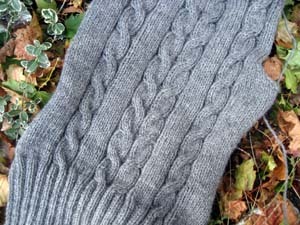 Sweater knitting. That’s right, dear readers, I am knitting a sweater because I signed up for NaKniSweMo. Really, it’s all Margene’s fault. She signed up and then wrote about it and before I knew it I was signing up and showing Hannah sweater patterns and ordering yarn and that was that. Truly, though, a sweater for Hannah is a joy to knit because she’s so tiny. She chose the Central Park Hoodie. As much as I love tweedy yarns, Hannah hates tweedy yarns so, while I pushed hard for Peace Fleece, the yarn she chose is Plymouth Galway Highland Heather in a really soft shade of gray. See the pretty cables? Ooooh. Ahhhh. The left front is about half done. At the risk of incurring the wrath of the Knitting Goddess, I may actually finish this thing by the end of the month. The best part of making up at times is the making out 🙂 Go, go, go with the sweater knitting, and your Hannah certainly has good taste. 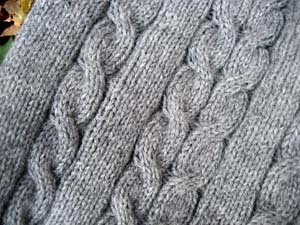 I’m a tweed lover too but this sweater is really lovely – the cables make it look like liquid silver! Glad all’s right with your world again hunny! I’m afraid I would more in your ball park than Dales! Like, “back off beeatch”! Just sayin’! Love it and keep up the good work!